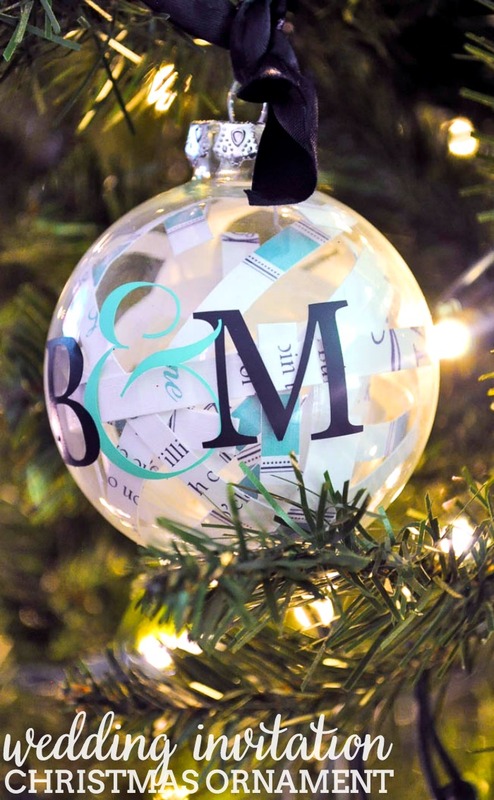 Celebrate the Big Day with this Wedding Invitation Christmas Ornament! This past week, my husband was gone on a service trip with students in Colorado and he wasn’t allowed to use his cell phone. Zero communication!! I’ll be honest with all of you: in this day of cell phones and constant communication, it was very unsettling to go a week without talking to my husband. I couldn’t ask him if a Christmas idea was okay for a family member or tell him about something funny I saw. I love having a partner to share life with, so he was definitely on my mind Sunday as I decorated a Wedding Invitation Christmas Ornament. 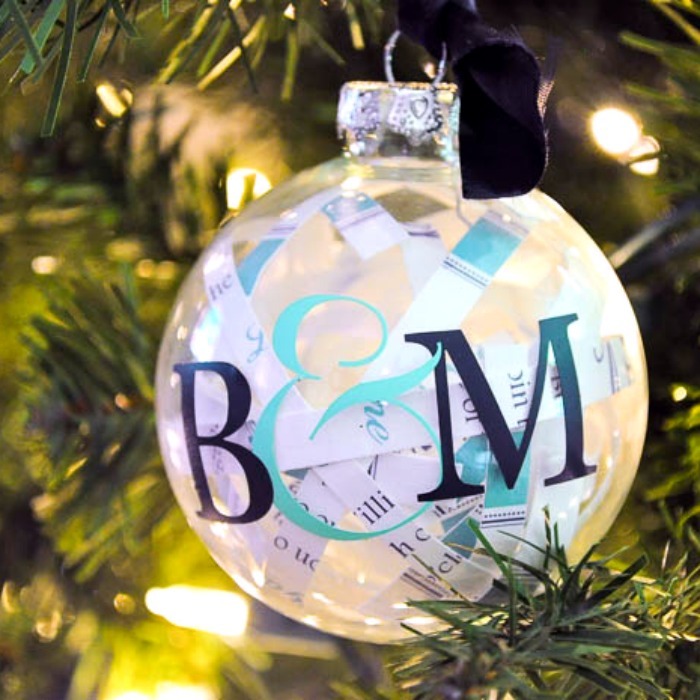 I love this design for a few reasons: 1, it was a fairly easy process; 2, it didn’t take a lot of materials; and 3, it would make a fabulous gift!! I would love to receive this as a gift, especially if this was my first Christmas married. We often keep invitations and cards tucked away somewhere for no one to see; my mom has a huge box of them tucked away in her closet. 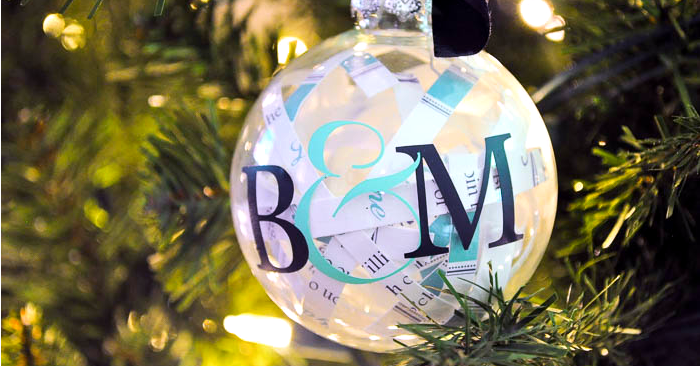 Why not put them to good use instead and make a memorable Christmas ornament?! 1. Cut the wedding invitation into thin strips. 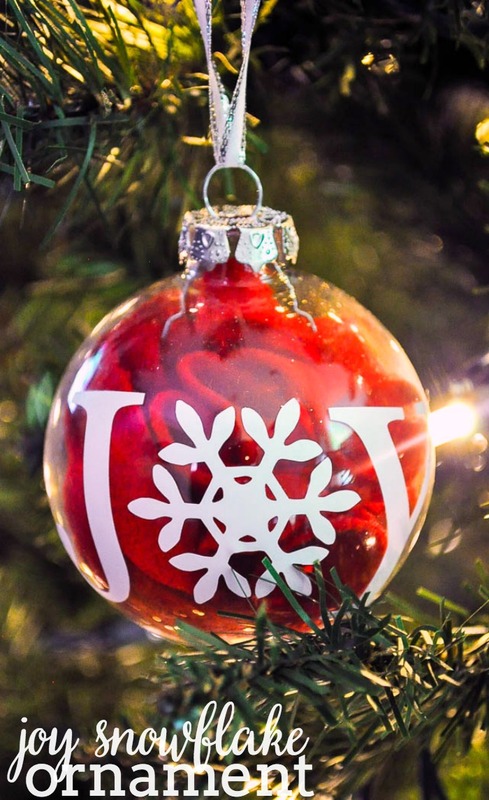 You want to make sure they are thin enough to fit into the ornament. 2. 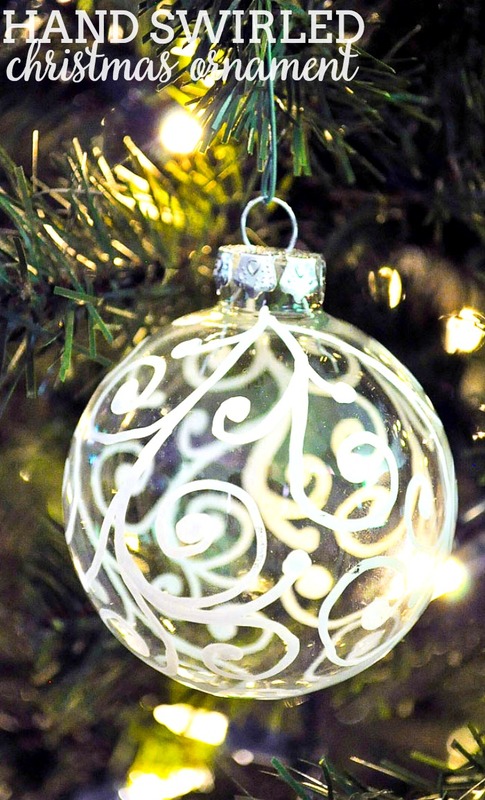 Lightly curl the strips around your finger and tuck inside the ornament. I did a mix of individual strips and a couple strips together to curl and place inside. 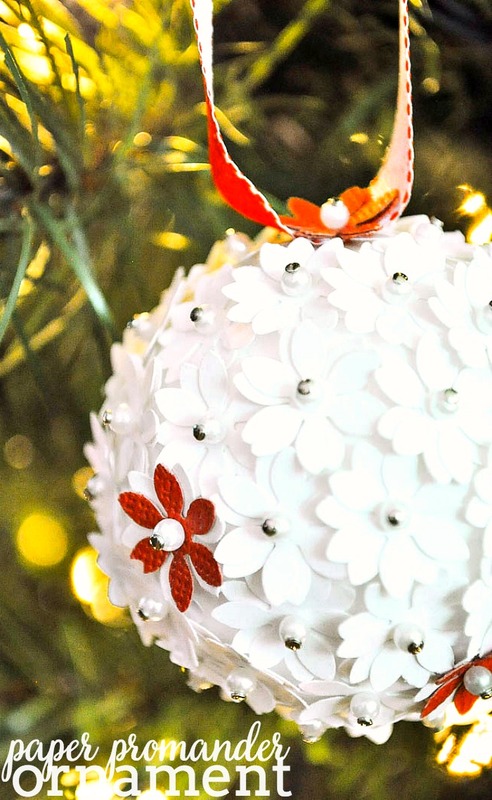 Curling them will allow them to fit better in the ornament with a rounded shape. 3. When all the strips are inside, decorate the outside. I use my Silhouette machine to cut out vinyl letters, but you could also use Paint markers to just as easily decorate the outside by hand. As for the design, I decided to use our initials and an ampersand because that was a prominent design feature in our invitations and wedding. You could do first names or even the last name. 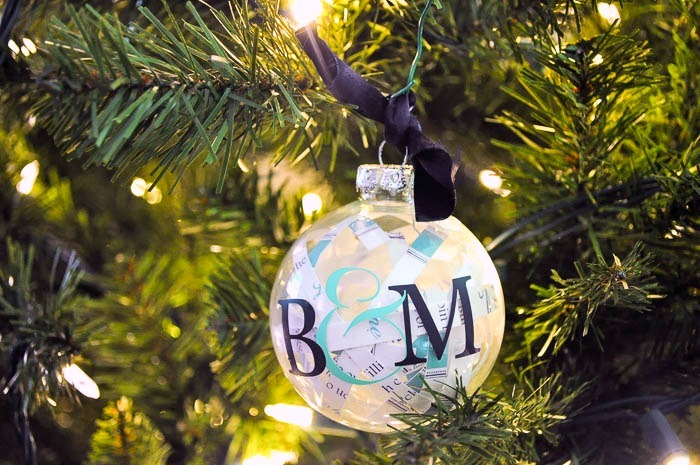 If being given as a first Christmas ornament, you could also include that phrase or maybe the date of the wedding. 4. Then I added a little ribbon bow that matched our wedding colors. Like ours, an invite might even come with the invite that you could use. Other uses: I think this concept would be great for all the BIG moments of the year. Did someone just graduate? Use their graduation invitation or announcement. Baby? Use the baby shower invite or a birth announcement. Really think about what cards, invites, or announcements you have been given and make a really special and personalized gift! This is such a sweet idea. I got married on Dec 28th and wish I’d thought of this back then. Pinning for future reference. Wow, a whole week without talking to the hubs would be super difficult! Of course I guess that also helps you appreciate him even more when he is back 🙂 We would definitely make it to celebrate our wedding! Now I just need to get one of those clear ornaments. Thanks for sharing! My first thought was it would be a perfect way for high schoolers to ask their dates to a winter dance. What a sweet idea, Christine! I love it!! AHHH forgot to answer the question…Maybe I’d fill mine with a birth announcement! This is an awesome idea Maggie! Pinning and sharing and I’d love for you to come link it up at A Handmade Holiday Link Party going on right now on my blog TinySidekick! I love the wedding invitation idea, but knowing my family no one would be able to put it together! 🙂 I think it would pretty to do one with Love on it!